Ok, so I got excited after I did that first trip. I really wanted the Complete Multi-Purpose solution because I needed it. I decided to run up to my 24 hour CVS. Sure enough they were out of the razors but they had the Complete Multi-Purpose solution. In addition, I decided to do the AMEX deal! Will now fill out MIR (Mail In Rebate) for $15 Gas card! Profit=86.85-10(ECB)-15(Gas Card)-75(Value of Gift Cards)=$13.15-.42 (stamp) = $12.73!!! 1 Peppermint Patty .50 (no coupons) I had to get this because as I handed over my coupons I noticed I was going to go over because I decided to use the $1.50 Colgate coupon. My husband loves these! 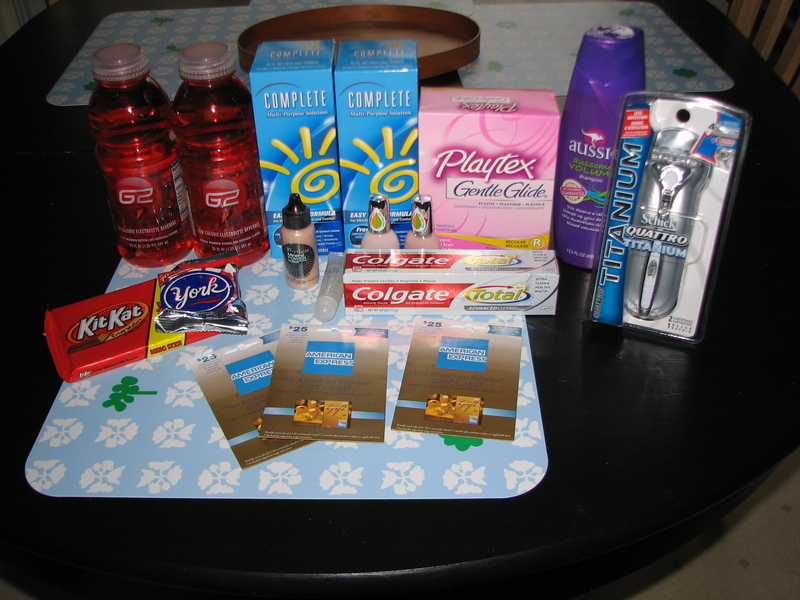 Here is a picture of all of my CVS purchases on 11/28/2008.